My memories of Nutella go right back to the beginning of my childhood in England - I was around 9yrs old and Mum bought one of those little white lidded jars from our local shop. She didn't know what it was but it looked chocolatey and she knew her eldest had a sugar addiction like no other, so she decided to take a chance and buy a jar. And I'm sooo glad she did. We'd typically indulge in Nutella on toast as an after school treat - but I'd typically indulge in eating copious amounts off a spoon when no one was looking. Alas, it was an indulgent and expensive treat so a jar would only frequent our cupboards on rare occasions. Nutella seems to have undergone a revival of late with an attempt at a 'healthy' marketing campaign but I think we all know that whilst a little bit spread on toast might be ok, huge globs of it injected into our veins is just asking for trouble. So today, I present to you trouble x100. Trouble wrapped in trouble if you will. I used my standard cookie recipe to start this recipe and added a tsp of vanilla bean paste and lots of Valentines sprinkles to make them more seasonal. I wish I had some heart sprinkles to jazz them up even more but actually I like the subtlety of this romantic offering. The key to this recipe is getting the Nutella nice and cold to make it easy to work with. I popped my jar into a freezer for about an hour and then used a teaspoon to make little balls to sit in the middle of the cookies. A melon baller would be perfect for this task so if you have one, use it! 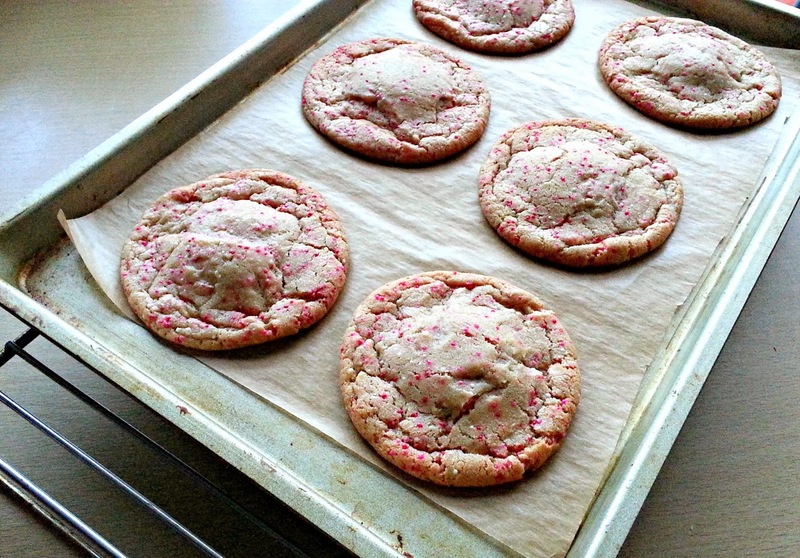 I baked these cookies for 10-12mins but watch them closely if you like a chewy cookie. The edges go brown very quickly and that's your sign that they're ready to whip out of the oven. If you eat them straight away (not that I know ANYONE that would do that) you'll find the Nutella is runny and heavenly. If you leave them overnight the cookie will remain chewy and whilst the Nutella will 'set' a little, it'll soon warm up in your hands. This cookie is so simple to make and if you know a Nutella addict then I implore you to make these for them as a treat, you won't regret it. And neither will they. 1. Cream butter and sugars till pale and fluffy, once creamed, combine in the egg and vanilla and vanilla beans. 2. Mix in the flour and salt. Add sprinkles and mix well. Refrigerate dough for at least 1 hour. 3. Once the dough is nearly chilled, preheat the oven to 180°C, gas mark 4. 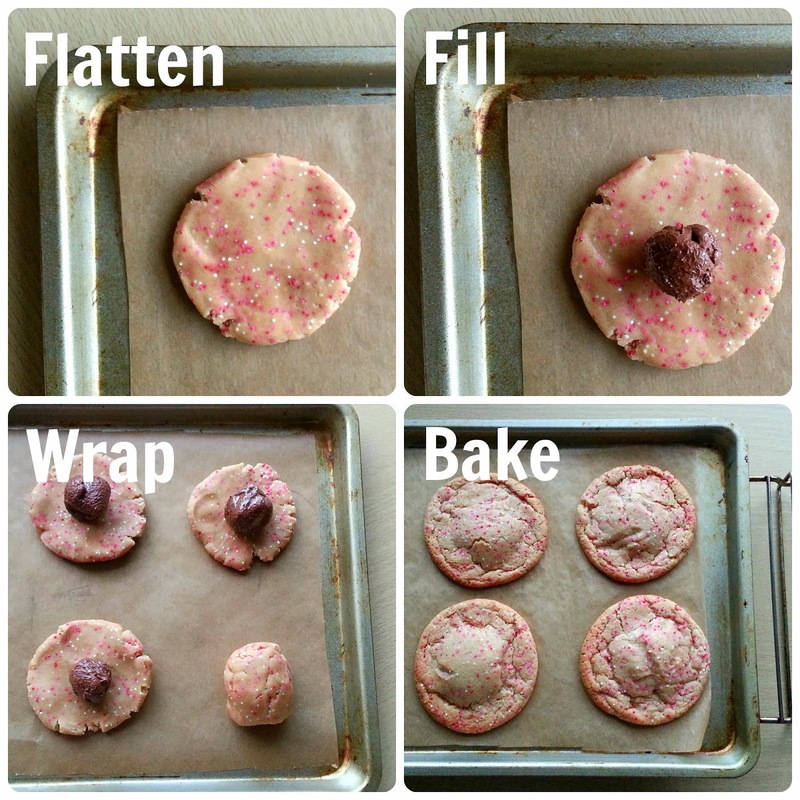 Line cookie sheet with baking paper. 4. Remove dough from fridge and roll a heaped tablespoon worth of dough into a large ball. Flatten and place Nutella in the middle of the cookie. 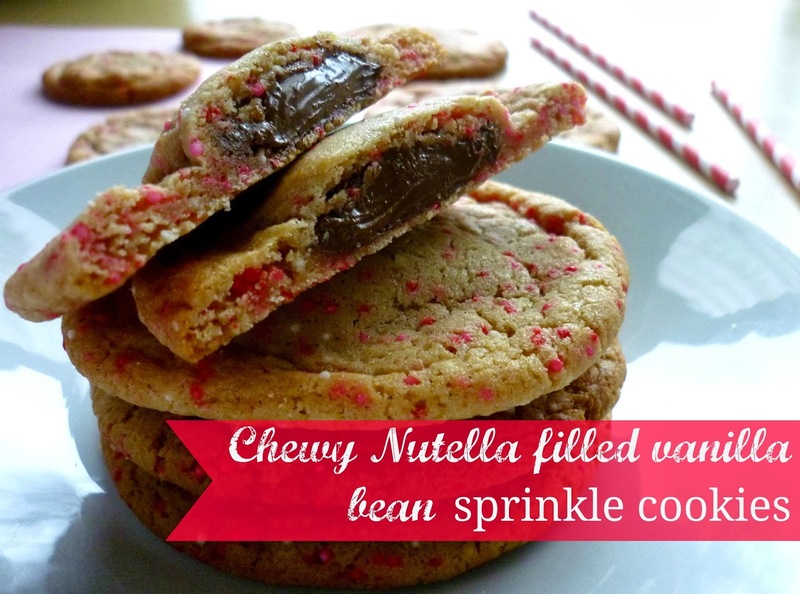 Wrap the cookie around the Nutella and pinch off edges so the Nutella is contained to avoid leakage. 5. Bake for 10-12mins until the cookies are slightly brown around the edges and the centre will remain soft and chewy. 6. Remove from oven and allow to cool on baking sheet. Transfer to a wire rack to finish cooling and eat one whilst warm for a truly indulgent cookie experience! 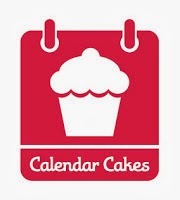 I'm entering this bake in the Valentines Bakes Calendar Cakes Challenge hosted by Dolly Bakes and Laura Loves Cake. There are bound to be lots of yummy Valentines inspiration over there so go and check out everyones bakes! Oh my oh my...I can't wait to bake these immediately, they sound and look soooo delicious! I'm new to the nutella bandwagon, having only discovered a love for it in the past year and now I can't get enough of it!! Oh wow, you managed to hold out that long before sampling the chocolatey goodness?! Kudos to you! These cookies are so moreish, it's essentially like having a cookie with a teaspoon of Nutella added to the mix :) Let me know if you try it! Wowzer. 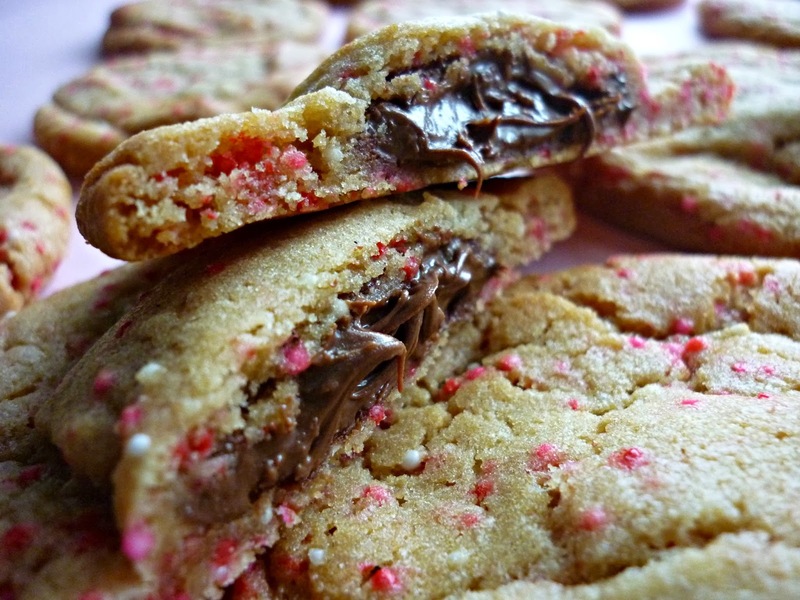 I am DEFINITELY trying this out with chocolate chunk cookies!